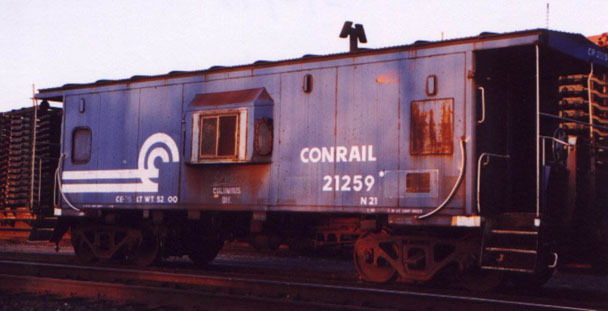 Conrail as we knew it no longer exists, this page lists sightings from the last year of operation from June 1, 1998 to May 31, 1999. Sightings are listed from most recent to oldest. Sightings prior to June 1, 1998 can be found on the Older Sightings Page. Scott Pelinsky May 31, 99 Former Erie Yard in Buffalo, NY. N-20 22135 J. E. Landrum May 31, 99 Lima, OH. MGA MGA 901 Matt Provenza May 30, 99 At Island Ave yard in Pittsburgh PA.
N-9 18236 Tim Frederick May 2, 99 At Moraine, OH. N-21 21259 Tim Frederick May 2, 99 At Moraine, OH. N-7D 21114 Tim Frederick May 1, 99 At Marion, OH. N-21 21273 Scott Pelinsky May 1, 99 At Frontier Yard, Buffalo, NY. N-21 21220 Scott Pelinsky May 1, 99 At Frontier Yard, Buffalo, NY. this one had all of the windows plated over. N-5C 23147 Carl March 26, 99 Sitting in CR's Pavonia yard in Camden NJ, just adjacent to the 27th street hump yard retarders. Local rumors speculate that this might be the car being donated by Conrail for the Childrens Garden currently under construction at the NJ State Aquarium. I can confirm that a car is being donated, but I don't know if this is the one. Anyone know? N-10 24012 Bruce Mandell March, 99 In service in Avon, IN. N-5C 23144 Bruce Mandell March, 99 In the Yard in Reading, PA.
N-21 21204 Dennis Sautters February 28, 99 On a peddler freight westbound through Canton, OH. N-21 21201 Ben Russell February 13, 99 With layover power at Abrams Yard. 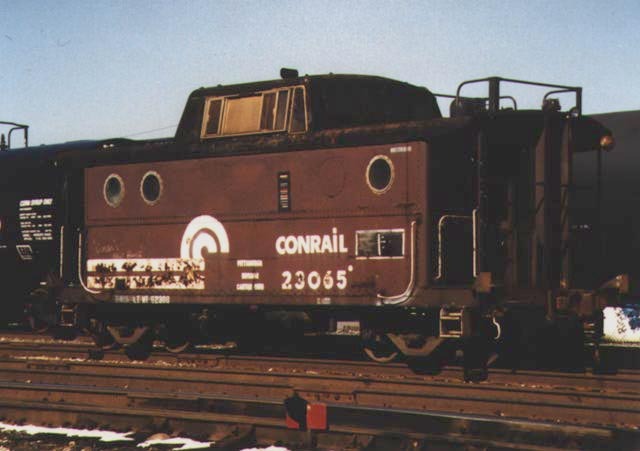 N-10 24040 Robert Sherwood January 29, 99 Had been working on the Chapman Local, spotted today in Allentown Yard. N-20 22131 rhughes50 January 21, 99 Canton, OH in regular service. N-21 21204 rhughes50 January 21, 99 Canton, OH in regular service. N-21 21259 Mike Hood January 21, 99 On the Franklin Local on the line between Dayton and Cincinnati, OH. N-5C 23144 Glenn C. Schwass October 13, 98 Seen on the back of a work train at Abrahms yard in King Of Prussia, PA. It looked pretty worn but wasn't bent up. N-12 24531 R. Sherwood September 21, 98 Allentown, PA. In Quality paint has been a fixture in the yard for a while now. N-21 21255 J.W. Montgerard September 14, 98 Assigned to the yard job at Paris, IL. N-21 21264 J.W. Montgerard September 14, 98 Left Hillery Yard in Danville, IL today on WSPA 22 (Paris to Danville Turn around Local). Once at Paris it was given to the WSAV26 (Indy to Paris Local) and taken to Avon Yard. A couple days later one of my old Hillery buddies who is now working at Avon called and said he just saw her go over the hump. N-8A 23667 R. Sherwood August, 98 Brought to Allentown by AL 19 and spent part of late August in the yard. N-21 21220 Jay Brown July 19, 98 Rockport yard, Cleveland, OH, parked with some ballast hoppers, not moved for last several weeks. 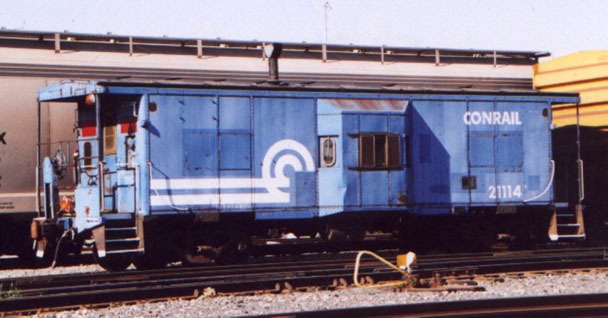 Caboose has had all windows plated over and been repainted in standard blue with small "can-opener". N-21 21242 Timothy Trebing July 13, 98 On WSAV-22 that travels from Indianapolis to Lafayette, IN. N-20 22139 R. Sherwood July, 98 Allentown, PA yard looking very well and active. This car is no longer active, it has been purchased and preserved by Walt Gosciminski. N-5C 23065 Jay Brown June 15, 98 Rockport Yard, still in brown paint. N-21 21295 Kevin Taylor June 8, 98 Heading west in Marshall IL, on a work train.